Over the past week we have dived on five local reefs to check out cyclone Debbie recovery. Most reefs in this northern Whitsunday region were badly damaged during the slow passage of Cyclone Debbie almost two years ago. Reefs on the South face of Gumbrell Island and on the north side of Saddleback Island previously had very high coral cover but had been devastated by the cyclone (see previous news item on March 2018). 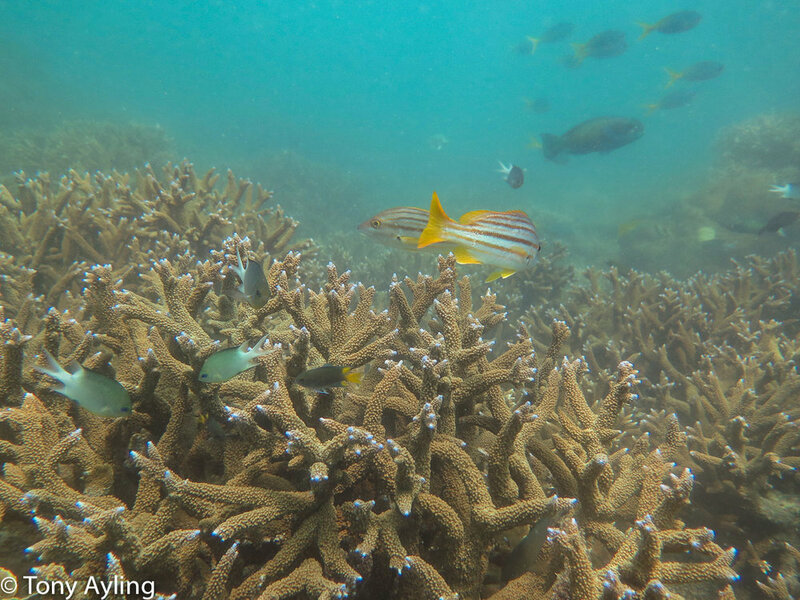 These reefs are only recovering very slowly, especially in shallow water where corals have been completely stripped off by the cyclone. 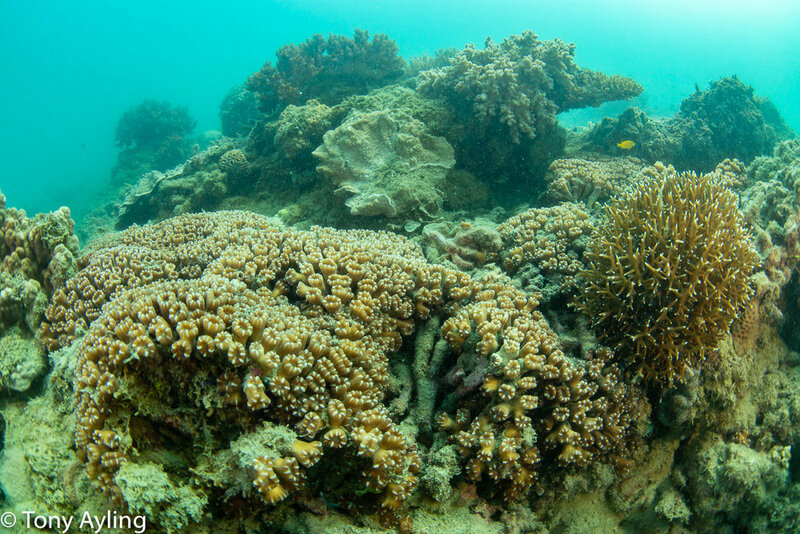 These areas were covered in algae with only the occasional small coral colony appearing two years after the cyclone. North spit reef was still mostly devastated in deeper water as well, although there were a few corals starting to regrow in patches and a few new coral recruits. 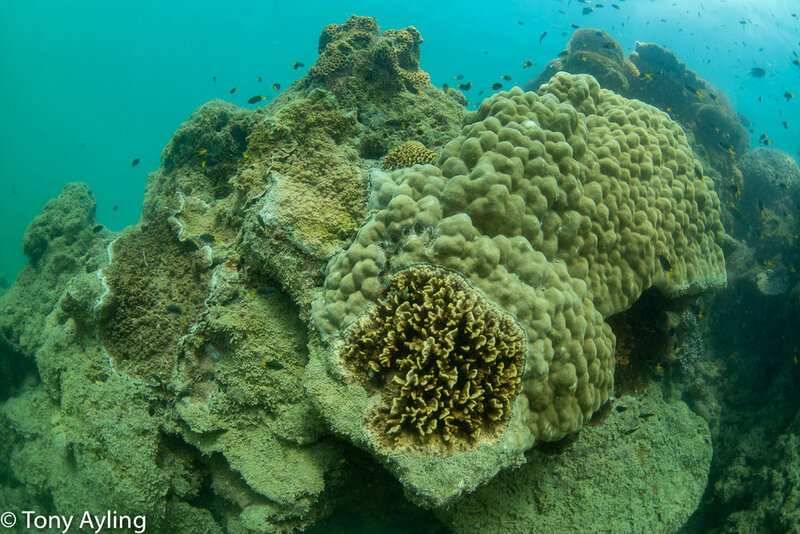 The deeper parts of Gumbrell Island, on the other hand, had started to recover, with many of the larger corals repairing themselves and surviving Acropora and Montipora coral fragments starting to grow rapidly. The reef off the northern side of the Saddleback Island spit had been turned into a rubble bank by Cyclone Debbie and coral recovery has been very slow after two years. Coral recovery on other reefs that were not completely devastated by Cyclone Debbie has been much more rapid. I’ve already reported that the reef in Bommie Bay on Saddleback has recovered rapidly and we confirmed that on this recent trip. It is now hard to tell that there has been a cyclone on this reef! Recovery has also been very rapid on Middle Reef, an isolated, long, narrow reef that is about 1,300 metres off Hydeaway Bay. This reef now has lush cover of Acropora staghorn corals and whorl-forming Montipora corals that have all regrown from fragments within two years. It appears that the reef on the south side of the Saddleback Island spit had only light cyclone damage on the shallow sections of the reef and this has almost completely recovered (I’ll be making another post on the condition of this amazing reef).